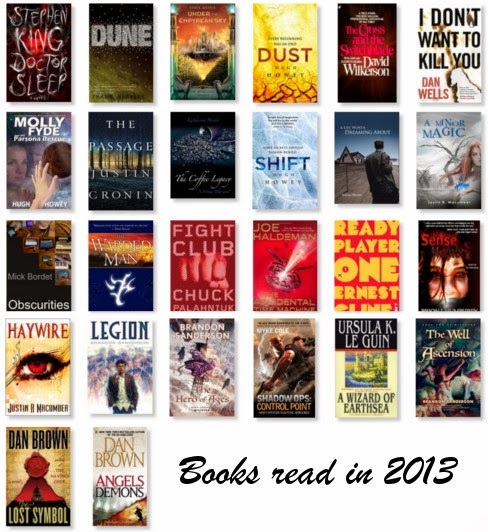 *After writing this post I finished The Firm by John Grisham making 27 books for 2013. 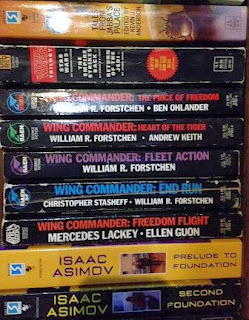 It's funny, I have read a lot of the classics of literature so now I'm trying to catch up on the classics and current works of sci-fi and fantasy because that's what I want to write. Yes, I want to write genre fiction and I haven't read much of it, well I hadn't but now I'm making my way through it. I read many classics in high school and after because I was going to be an English teacher before I decided on 3D art and multimedia instead. Also one of my best friends did end up being an English teacher so while we were in college we would read a lot of the classics. We'd start the same book on the same day, then write how many pages we read on a white board in the kitchen to goad each other to read more. It was really fun. We would also go to a St. Vincent De Paul every Tuesday I believe because we could get books for as little as 30¢ but usually just under a dollar. We would scour the shelves for a good 20 minutes and then walk to the counter with a decent stack of books. Mostly we bought classics. They had a steady intake of books and sometimes you'd find a nice hardback or a returned almost new paperback. Sometimes even newish books. We would also always try and find a copy of Wuthering Heights and sneak it onto the other dude's stack. We both hated that novel when we had to read it over the summer for A.P. English our senior year. Back in 09' I actually reread it for who knows what reason, and ended up liking it. The characters were deplorable people, but I appreciated the book for what it was and some of the things it did. Here's the review I wrote up about it. When I hear authors answer the question "what's the best advice you can give to aspiring authors" they usually say two things. Write a lot, and read a lot. Now I'm not reading a lot just so I can become a better writer, though I do try and learn from every book. I read because books are a passion of mine. One of my favorite things to do has always been reading books. I used to work sometimes for my grandparents. They ran a TV repair business and sold Zeniths out of their basement and when they went on vacations sometimes they needed someone to be at the house for drop offs and pick ups. There were usually only a handful of these in a day and maybe a couple phone calls. So most of the time I had an empty quiet house for hours. I would always bring a stack of books with me and I loved the fact that I was getting paid to do a massive amount of reading. In high school at lunch I could usually be found with the little acoustic guitar I kept in my locker, or a book. When I finished my work in class, I'd whip out a book and get to it. What books have you read this year that you absolutely loved? How many books have you read this year? Are you on Goodreads? It is a fantastic way to track what you've read and review them. If you're on there and you're not already my friend, add me as a friend. Merry Christmas! Have you heard my Christmas story yet? It's right at the top of the page and it will bring you cheer! Just sayin' :) Thanks for stopping by.